Rajinikanth, Akshay Kumar, Amy Jackson, Shankar Shanmugham, AR Rahman and Subhaskaran Crazy Combination India’s First ever 2.0 Movie in 3D. India’s biggest high budgeted Magnum Opus 2.0 Movie opened with tremendous response at global box office. 2.0 is getting homogeneous response and increasing the numbers day by day at Global Box Office. 2Point0 Movie is the World’s No.1 Grosser at the Global Box Office for the Nov 29th – Dec 2nd Weekend. 2.0 Movie is making tidal waves at Global Box Office with a Thunder Storm response from Audience, Critics and celebrities as well. This Indian Box Office Extravaganza creating huge numbers by breaking the records in terms collections. The 2.0 Movie Grosses $57.14 millions at Global Box Office and Stands at No.1 Position by beating Fantastic Beasts $51.40 millions slipped to 2nd Position in this Weekend. 2.0 Movie has earned Rs. 400 Crores Gross at Global Box Office in the 1st Weekend. Where it has grossed $3.5 millions alone at US Box Office. The 2.0 Movie surpassed the life time collections of Ram Charan Rangasthalam . 2.0 Rajinikanth, Akshay Kumar and Amy Jackson Starrer has also become the highest grossing south Indian movie in the USA. It has surpassed the lifetime numbers of Rangatsthalam Movie in just 4 days of its release. 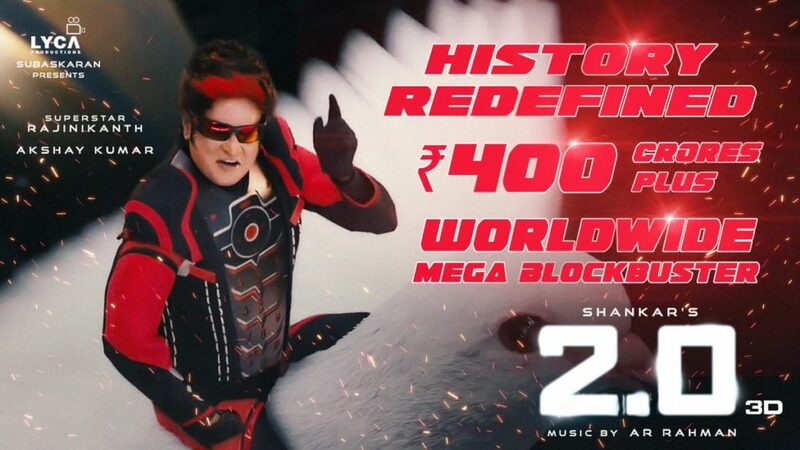 2Point0 with $3,588,450 is now 2018’s Highest Grossing South Movie in USA. It overtakes Rangasthalam‘s Life-time Collection of $3,513,450 Trade Analyst Ramesh Bala tweeted. Where 2.0 Movie is Released in 3 Languages Telugu, Tamil and Hindi Versions and Rangasthalam is a direct Telugu Movie. The Hindi Version of 2.0 Movie alone in India crosses Rs. 100 Crores at Indian Box Office in the 1st weekend. The Shankar directorial Magnum Opus 2.0 is the most expensive Indian Movie reportedly with a budget over Rs 500 crores. Trade analyst Taran Adarsh tweeted the box office figures of 2.0 Movie Hindi version collections on his Twitter account. He tweets, 2Point0 puts up a SUPERB TOTAL in its extended opening weekend… Biz on Day 3 and Day 4 specifically was fantastic…with tremendous response from Audience. The Visual VFX Grenadier mints Thu 20.25 cr, Fri 18.50 cr, Sat 25 cr, Sun 34 cr. Total: ₹ 97.75 cr+. India biz HINDI version alone. 2.0 Grossed 400 Crores in 1st Weekend. Rajinikanth, Akshay Kumar, Amy Jackson, Shankar Shanmugham, AR Rahman and Subhaskaran Crazy Combination India's First ever 2.0 Movie in 3D. PrevCelebrities Tweet about 2.0 Exclusively!